The little boy feels a bit cheated and he bursts into tears. Somehow the victory would have been sweeter had his dad shared it. I am that little boy. And I cried this morning. All copies of 34 Bubblegums and Candies, sold from now on will have the National best-seller tag. Despite everything --it does feel great. Thank you all for your marvellous support and infinite amount of love and good wishes you shower me with. This book was totally from the heart. It was born from pain. It also involved many sleepless nights and a lot of hard work. I get hundreds of fan mails from people who have read it. Yet, the novelty never wears off. I value each mail that I get, I remember each person who writes to me, because my book and my words have touched your lives. I am humbled and honoured. And yes--I think I am definitely luckier than the little boy. Glad that I am the first one to comment here. I wish you all the success for this book, and the many many more books to come! I thoroughly enjoyed reading it, and my mom loved it too! This book certainly deserves the "National Bestseller" tag! Am I the first to comment? Yipee !!! Hey Preeti, a nice sweet and real motivational post have in place. And just to share last week i ordered you first book, and it would take at least 10 more days to deliver. I am already a fan follower of you writing, I an just waiting to read through the book. Cheers and all the wishes for you second book. This is simply awesome! Congratulations Preeti! Book definitely deserved the tag and the you definitely deserves all the accolades! I have lurking around for a while, couldn't stop commenting myself on this! Congrats once again! I live in London, and everytime people visit Bangalore I request just one thing, to check for your book in crossword but usually there is only one answer ....out of stock!!! Is there any way i can get it? I so badly wanna read it! Congratulations! 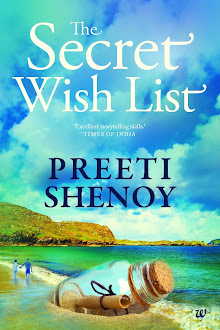 Preeti....wish you all the best for the International Best Seller now! Congrats Preeti.. You n ur book is a great inspiration and I'm sure ur dad will be watching over you and smiling at your achievements..
Best wishes for your future books! Congrats a ton preeti. You deserve this. Your book is one of my personal favorites too..
Delurking after a long time to congratulate you and wish you the very best in the future. As usual, very nice post (nice is such an inadequate word, isn't it?). I'm so happy for you, Preeti! It's a great achievement for a first book. Congratulations from the core of my soul. and hey! youve been tagged! Hearty congratulations on your success Preeti! Wishing you many more of them and may you really feel your dad's presence on this joyous occasion! Congratulations Preeti. I have recently moved back to India, now will get to get a copy of your book with the bestseller tag on it! Congrats Preeti!! Well deserved, and wishing you many many more to come!! 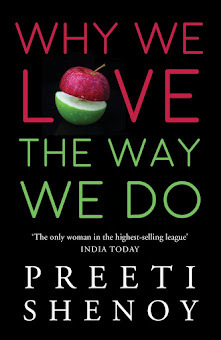 Congrats preeti... your book and so you completely deserve it. He must be a proud dad in heaven,preeti, for having a loving daughter like you. Congratulations, your writings deserve the tag. Hard work does pay off...you are one great example. All the very best for all the coming books too. Your dad must surely be feeling proud and happy!! Thank you all for the wonderful messages of congratulations. I have read each and every comment and it is much appreciated and cherished. I was going to reply individually (as always) but realised they would all say the same thing..A heartfelt and sincere thank you. Guto--My book is available in the U.S too now but I am glad you found someone who ships to south america as well. Congrats Preeti-well deserved. Big fan of ur blog- have ordered your book too. congrats..........i will grab a copy soon. Totally agree with all the comments above. However i don't think your post was complete in the true sense. There should have been another line after the last one which says (and those aspects features in some of the comments above too) that whilst you may have been luckier than the little boy there are a number of others who are equally lucky to know you and gain from your positive attitude including yours truely. Am extremely proud of you and confident that you have it in you to make it to the big league and yet not change as a person - 13 years of experience tells me so. Your Dad I am sure is very proud of you (wherever he is) as are all of us. Lovely LOVELY, touching post Preeti!!! U deserve all this and more!!!! I do hang my head in shame coz I havent yet been able to get my hands on ur book yet;-(. None of the [few]bookstores I went to[in the limited time I had] in Bangalore had it[I knw, I knw I must been haunting the wrong shops;-/] but I havent given up. I've said this earlier and say it again and again....sooo proud of u and Wishing U the very best life Life has to offer Preeti!!!!! Congrats, baby. How 'bout Indian language translations? Cogratulations Preeti. I will buy your book soon. You convey your thoughts so simply, in simple words and beautifully. You are so pure, honest and such a sweet person. big hugs ps and hearty hearty congratulations. Not everyone can do what you've achieved. Why do you feel that your dad doesn't know about it all? He watches over you every moment and makes sure that no harm comes your way. You touch lives. That is probably what he wanted. The greatest of creations come because of some pain somewhere. Hi Preeti, Congratulations!! And I identify so much with what you have written here, absolutely true!! Keep it up.. Waiting for the next book!! !